Well, it’s the holiday season again. Which gives me an excuse to try to post some things on a daily basis. 12 days, to be precise. Get it? 12 days of Christmas. Yeaaaaaaah. The first thing about Christmas one should learn about is Krampus. Krampus is the monster friend/colleague of Santa Claus/Sinterklaas/Saint Nicholas in his homeland of Eastern Europe. Krampus is meant to be the stick in the carrot/stick dynamic, threatening children on the naughty list with blunt objects and rusty chains, or taking them away in a sack. 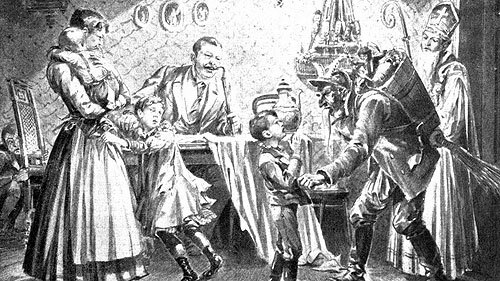 Krampus is an awesome meeting point between pre-and-post Christian folklore in the region, and its a shame that the tradition has not caught on over here. Many Internet nerds, however, adore Krampus, and make sure to reference him every Christmas. Belsnickle is, depending on where you are, either another companion of Santa Claus or his equivalent figure. He seems to be the basis for both Santa’s fuzzy costume and his love of stuffing stockings: Belsnickle either gave children socks full of candy, or coal. 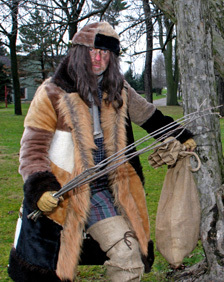 Sometimes he would also carry things to threaten violence like Krampus. 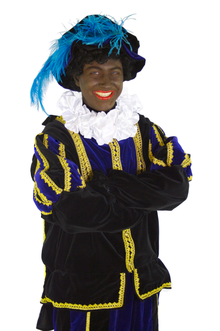 Black Peter/Zwarte Piet is the one who supposedly went down chimneys to deliver gifts, thus the source of his blackness. In early versions of the story, he was a demon enslaved by Saint Nicholas to show his conquest over evil. Since then, he has essentially become a gollywog, which is why some people may not be too comfortable with him around. This entry was posted on December 14, 2010 at 12:55 AM	and is filed under Leinks. Tagged: Christmas, Folklore, Good Ideas, Monsters, Wikipedia. You can follow any responses to this entry through the RSS 2.0 feed. You can leave a response, or trackback from your own site.